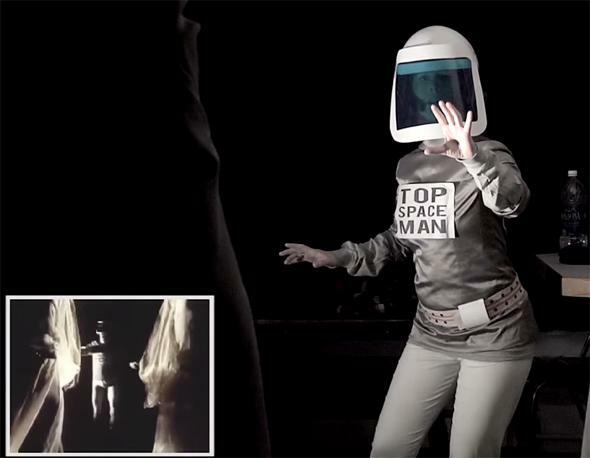 Space Weird Thing: A video parody of Space Oddity using only common words. Marian Call is a Space Weird Thing. Photo by Marian Call and Molly Lewis, from the video. I recently wrote about Thing Explainer, a book by my friend and xkcd author Randall Munroe that explains complex scientific ideas using only the most common 1,000 words in the English language (originally motivated by his flippin’ brilliant Up Goer Five comic). As I wrote that article (also using just the 1,000 most common words), I wondered how far someone could take this idea. Now I know. My dear friends Marian Call and Molly Lewis—geek musicians and very, very clever people—made a music video that is a shot-by-shot recreation of David Bowie’s “Space Oddity” using Up Goer Five speak. I have a lot of smart friends, and I love them all. Go listen to more of Marian’s music, and Molly’s music, and buy all the things. Read more in Slate about David Bowie.